easy removal of the edge of the baking mould.Removable bottom. Please make sure to wash all pieces in the set in warm, soapy water, rinse, and dry of your new bakeware. Hand washing recommended.Do not use sharp sharpening on the surface of the pan to protect non-stick coating. Please make sure to wash all pieces, rinse, and keep dry of your springform pans. Intact and delicious cake appear to you after baking for several minutes,leak-proof tight seal prevents messy spills. Perfect for baking cheesecake,pizza,bread,individual desserts and recipes. for both you and the environment. 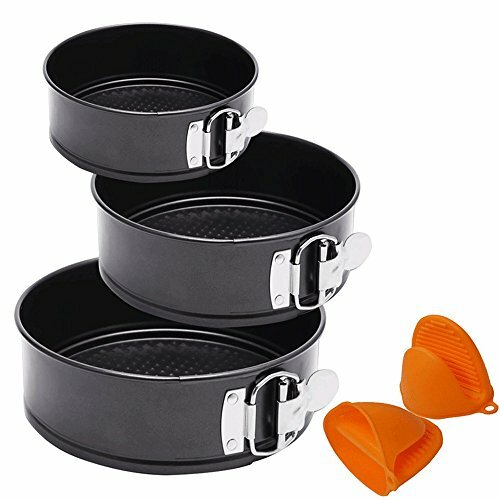 Springform Pan Set including:7inches/18cm,8inches/20cm,9inches/23cm with 1 pair Cooking Pinch Mitts. Nonstick cheesecake pan heat-resistance temperature: 445℉ (230℃);made of a strong,durable,superior heavy carbon steel material,BPA free. Quick release spring latch removable bottom with nonstick coating.But ,the batter don't adjust too loose! If the batter is too thin, it will leak. This cake pan hand wash recommended .Choose soft tools and mild detergent when you clean it to protect nonstick coating. Avoid sharp and rough tools to scratch the pan.Please make sure to wash all pieces, rinse, and keep dry of your springform pans. The springform pan specially designed for baking cheesecake,pizza,bread,individual desserts and recipes. If you have any questions about this product by Vivoice, contact us by completing and submitting the form below. If you are looking for a specif part number, please include it with your message.